THE Source for Crayon Packs! Bulk, 2, 3, & 4-pack Wholesale Triangular Crayons for Restaurants | CrayAngle Restaurant Crayons | Twisty-Twigs Wax Play String - Compare to Wikki Stix! 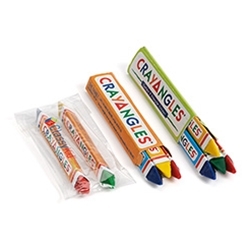 CrayAngle triangular crayons will not roll off of tables! With their smart ergonomic shape, you'll be sure to please customers. You've found the leading producer of shaped-crayons in the industry. Each year tens of millions of our best-selling triangular crayons teach little hands how to properly hold a writing instrument. Every day in thousands of restaurants, customers are happy to not have to chase crayons that have rolled under tables or that became trip hazards. Take advantage of the widest selection and best deals on top-quality crayons available today. Price match guaranteed. We will not be undersold! Let us know if you find a better deal on a similar/imitation item. CrayAngles™ are patented, trademarked, and copyrighted by Family Hospitality GroupLLC in the United States and other countries. You can only find them here and through our distribution partners such as Hoffmaster, Edward Don & Co, and numerous others. Ask your distributor rep to carry these for you! Twisty-Twigs wax play strings are a great solution if you have kids coloring where they shouldn't! Our Twisty-Twigs are not as gooey as compared to Wikki-Stix and Bendaroos brand wax play string, so they won't leave behind a residue - and our prices can't be beat!